The heel of the Italian boot is in the Italian region of Puglia (Apulia). By geographical name the heel is called Salento and is very close to what lies across the Adriatic —the Balkans and Greece. At some points the distance is only about 80 km (50 miles). 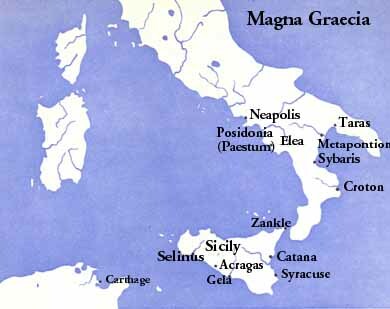 It is no wonder that when the ancient Greeks came calling at the beginning (about 600 BC) of their impressive cultural expansion that gave us Magna Grecia, they found the area occupied —it was that easy to get to. In this case the coastal regions of the heel were in the hands of an early people called the Messapians, also an Indo-European people that had sailed or rowed to Italy much earlier from across the Adriatic. 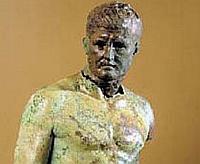 These days, Brindisi has one of those fine medium-sized museums that you find throughout Italy. They are more satisfying than the tiny museums that have a single specialty display, and they won't grind you down like the huge museums (such as the National Museum in Naples). Besides, since the medium museums have a tighter focus, you will find detail in them that you won't find in larger facilities. It is the "F. Ribezzo" Provincial Archaeological Museum and it provides visitors with six sections devoted to culture and history of the area: epigraphy, sculpture, the antiquarium, prehistoric, coins, and the showcase item—the Bronzes of Punta del Serrone (now also called the Bronzes of Brindisi). The museum is named for Francesco Ribezzo, a great scholar and student of the Messapian culture. It is an absolutely well-ordered and finely detailed series of displays. It certainly isn't the first time that the Italian seas have yielded ancient treasures (think of the Riace Bronzes) and it won't be the last. As with most such finds, it isn't certain how the objects wound up at the bottom of the sea. They might have been jettisoned in a storm (no ship was found near the items); some historians say the items may have been held to be of inferior quality and were being shipped to the foundry in Brindisi to be melted down and recycled. But no one really knows.